Welcome to another series of Workshop Wednesday's. I get the question all the time, “How much does living in an RV cost?” and “How can you afford to live full time in an RV?” I'm going to show you my full-time RV living expenses so you can see my budget, see how these expenses can change based on your travel style, so you can then crunch the numbers and put your budget together. 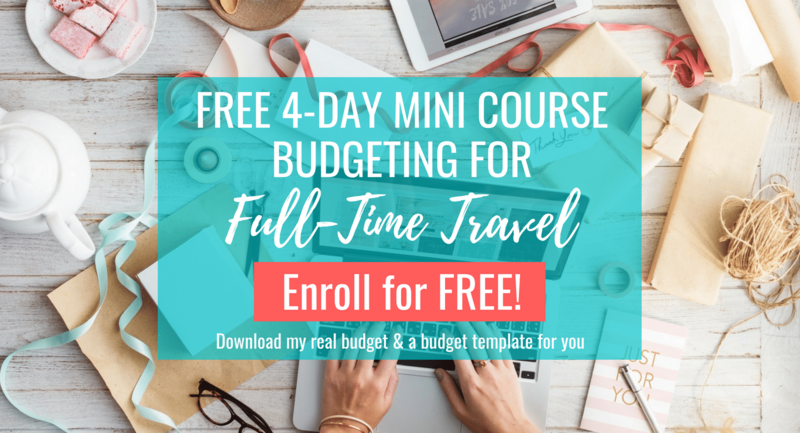 Make sure you sign-up for my free 4-day mini-course where you'll get a full copy of my budget, a template for your budget, and tips on how to save and slash your budget so you can travel full-time in an RV. When I first started out researching on how much living in an RV cost, I quickly found that there are so many variables to living costs. Much of your RV living costs are based on your travel style and the type of RV you are living in full-time. I found that my expenses are much lower in an RV then when I lived in a sticks-and-bricks home. Now that I'm in a Class B campervan, the Hymer Aktiv that is 20 feet, my expenses are even lower than when I lived in the first RV I purchased, the Winnebago Spirit that was 26 feet. Living in an RV and lowering my monthly expenses have greatly increased my happiness. I save money, and I get to live an incredible life traveling all over North America. My home and all of my belongings go with me where I go, and I can change locations when I want. This week I may be craving the mountains and the next week I can be by the ocean. That's one of the many benefits of living in an RV – you can change locations at will. I'm sure Amazon noticed! I'm an Amazon junkie! I still shop there since it's highly convenient for travel when you have the Prime membership. I also now have a rule, if something comes into the RV, then something must go out. Storage is limited and you need to be aware of the weight of your RV, so you don't have a tire blow out. How Much Does Living in an RV Cost? 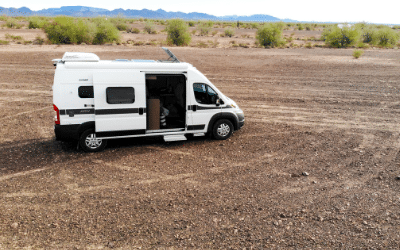 How I RV and travel can be much different than yours so when I show you how much living in an RV cost; keep in mind that these numbers can fluctuate drastically. 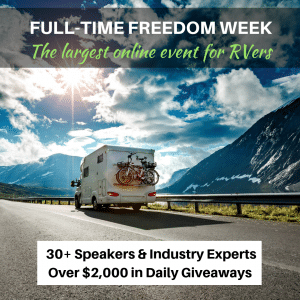 You are in ultimate control of how much living in an RV costs you. I try to live as frugal as possible, but I also want to LIVE, so some of my expenses are based on the things that are important to me; like enjoying sight-seeing tours, watching Netflix at night, making sure I always have an Internet connection, and continually accomplishing my quest travel goals which mean sometimes higher fuel costs. I tend to travel, on average, about 1,500 miles per month; however, that number can change quickly if I found a great area that I want to spend more time in or if the weather is terrible, I might drive more to locate more desirable temperatures, less wind, or no snow. Before you look at the budget, remember, this is based on how I live, but it gives you an idea of how much living in an RV cost each month and a starting point for you to begin your budget. I did not include the cost of an RV since this can be vastly different for each person whether you finance your RV or pay for it upfront in cash. Also, I save every month for every expense even if I pay it annually or it's an expense that varies from month-to-month. For example I save every month for RV insurance, but I pay this expense annually, or the cost for hair care is saved monthly, but buying the products to color my hair or cut it vary and aren't monthly expenses. I travel on average about 1,500 miles per month, so I budget $400 per month. Sometimes I'll spend that much and sometimes I don't. It depends on how much I decide to travel that month and if I've found an area I'd like to stay in longer. I'm very flexible with my travel so I can make adjustments where needed to make last-minute decisions on places I'd like to visit. 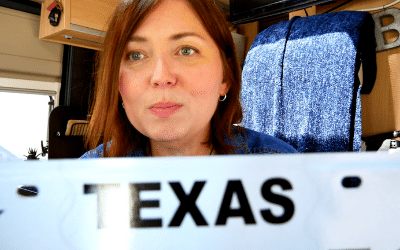 RV insurance is pretty reasonable, in my opinion, especially considering my insurance also covers being a full-time traveler, which is an added cost. Though I don't incur maintenance costs every month on the RV, and I have a 6-year warranty on the Hymer, I do save each month for future maintenance which can include the cost of purchasing new tires, which isn't covered by the Hymer warranty, oil changes, and washing the RV. RV registration is paid annually, but I do save for it each month. RV park rent or any place where I would pay a daily rate in exchange for a parking spot and possibly hookups is an expense I save for monthly though I rarely use it. Most of the time if I were to pay for a spot, it's because I wanted to visit a particular area and the boondocking or even dry camping, like at Walmart, isn't plentiful or non-existent. Also, I might pay RV park rent if I were with the Xscapers group and we were having an event somewhere and that was the designated location. So I just save up for it each month just in case I need it. This is another area with how much living in an RV cost that you can be drastically changed by your travel style. The daily rent at RV parks or campgrounds can get expensive each month, depending on each campground of course. Since purchasing the Hymer Aktiv, it's much easier now to stealth camp in places and not need to incur that fee since I'm entirely self-contained. State park passes are annual fees I pay to a particular state that allows me certain privileges for a more extended period. For example, I knew I would be in Washington State for a couple of months, so I purchased the Discover Pass that is $30 annually. It allows you to make use of any of the on-site dump and water stations and also allows you to day park for free. Typically parking in a state park can be $10 per day. Also, some Department of Natural Resource campgrounds are free if you have the Discover Pass. 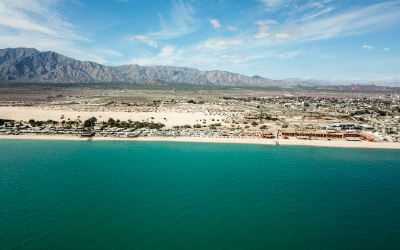 New Mexico is another state that has similar privileges as Washington, but in addition, you can get deeply discounted rates at state park campgrounds. The national park pass saves me a ton of money. I get in free to all National Parks and Monuments across the United States. I don't eat out very much but reserve some funds monthly that I can save, primarily if I'm socializing with others. It's so much cheaper to cook myself and save that money. For cell phone, data and Internet connection I have a Verizon plan for my cell phone and then a Verizon hotspot. In addition, I pay another $65 a month for an AT&T hotspot. You may or may not need two hotspots, but I do for the sake of making sure I almost always have a connection in case one area serves Verizon better than AT&T or vice versa. Since my entire business is online, having a data connection most of the time is critical for me. My propane costs last year were much higher since my refrigerator used propane or electric to cool; however, it was much cheaper to keep it on propane. Now that I have the Hymer Aktiv, my refrigerator is all electric. The furnace and water heater can either use propane, electric, or a mix of both. So far since I purchased the Hymer in May 2018, just 3.5 months ago, I still am 2/3 full on propane and haven't added any more propane since my date of purchase. My budget may be a little high on this, but I'm still budgeting so when it's cooler in the winter months when I might need the furnace more, I can have enough funds budgeted if I need it. This is another area with how much living in an RV cost can be different for each person. You may not need two hotspots or even any hotspots depending on what you do for a living, if you're retired, or just use your cell phone for calls and data. Since I sold my house and I don't have any relatives in Washington (my current domicile state) that can handle my mail for me, I chose a mail forwarding company where I pay an annual fee and then they can forward my mail to me once a month. I'm also currently looking into the Xscapers program of mail forwarding that can be completely digital so this cost might change as well. Since purchasing the Hymer, I decided to go ahead and get a gym membership so I can work out when I'm in the cities and take a shower in the facilities. That's the one thing that is harder in the van is to do yoga and I don't like rolling my mat out in front of everybody, depending on the area, and working out in public. Also, I prefer not to take showers in the Hymer as it's just more of a pain. Instead, I'll wash off every day with a wet washcloth and wash my hair in the sink. Lastly, you have to have an entertainment budget! Well, I guess you don't have to, but if you can, it's nice to have dollars set aside for when you're traveling and places you want to visit cost money. There's a ton of free sites out there to visit and explore, but some also cost. I don't always use the full $200, but again, I keep the money set aside for those months where I might spend more than $200, like when I get together with friends or family, and we tend to go out and do more. I hope that helps you to understand how much living in an RV cost each month and gives you enough information to either make some decisions for yourself and put a budget together. 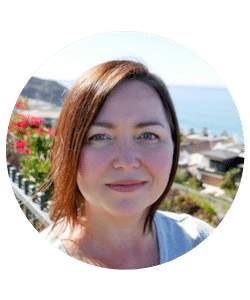 If you are looking for more information on budgeting and want my budget template and my budget, then sign-up for my free mini-course. 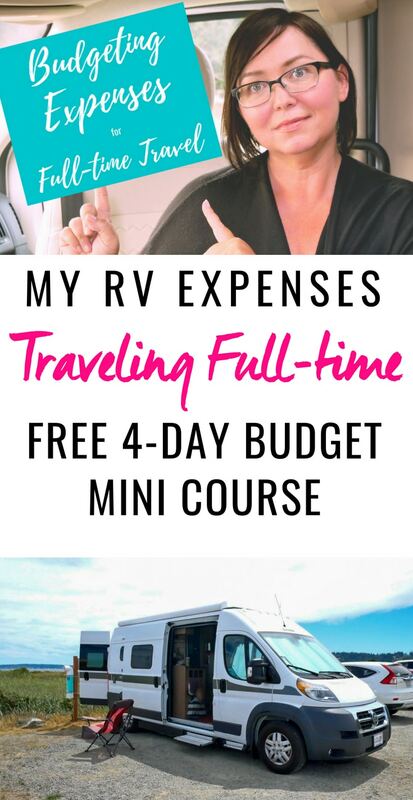 All of the costs here are specifically for traveling in an RV; however, in my free mini-course, I provide my entire annual budget in full, including my personal expenses and items you'll want to think about when you create your budget really. Plus I'll give you tips on how to save money and slash that budget to the bare bones on items like insurance (the things we must pay but aren't fun) so you can either save that money or use it to enjoy yourself during your travels. 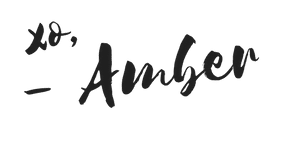 Along with an overview of each expense and the possibilities in how it can vary so you can adjust your budget accordingly. Amber, thank you for all the awesome information! I'll be going full time in a few months and will be purchasing the Hymer Aktiv with the loft. I'm holding off right now because it looks they are bringing the Mercedes sprinter into the market here. I saw a video from the Hershey show with the Hymer Aktiv loft on the Mercedes. Let me know how I can help you since you've helped me tremendously. I'll check your blogs and other sites and sign on. Hi Tom I'm currently on Cobra from my previous job, but will eventually get a health plan through Florida ACA. Hi Amber. I came across your channel as I was watching a few of my regular ones. Very well done. I can appreciate all the work you put into it. I went ahead and subscribed. What company do you use for the RV insurance if you don't mind me asking? I use Progressive since they also offer full-timers insurance.